Aerial view of roads in New York Jump to media player Anger is mounting in New York and New Jersey over the slow pace of snow removal following major storms which brought the region to a halt. 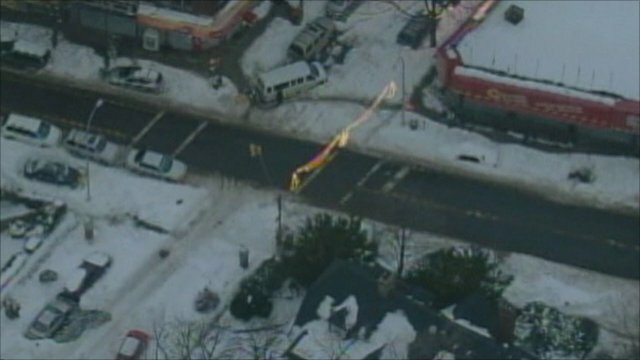 Aerial pictures show road conditions in Brooklyn, New York, and Neptune New Jersey. US snow: Air travellers 'in limbo' Jump to media player Blizzards are sweeping north along the eastern coast of the US and Canada, forcing the cancellation of flights and disrupting rail and road traffic. Anger is mounting in New York and New Jersey over the slow pace of snow removal following the severe storms which brought the region to a halt. Major thoroughfares in Manhattan have been cleared, but large parts of the city have yet to be ploughed. Many residents are stuck in their homes unable to get to work, and piles of snow are hindering ambulances. Aerial pictures show road conditions in Brooklyn, New York, where the subway service is still facing problems and Neptune New Jersey.